Architect Horace Trumbauer's original design for this room refers to it as "Museum." 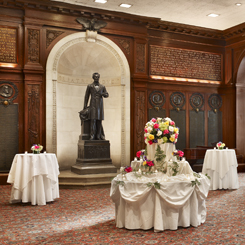 It was not until November 29, 1917 marking the League's 55th Anniversary that the room was officially dedicated as the Lincoln Memorial Room by League President John Gribbel. Part of the Library complex, the room contains a large collection of Civil War books. The west wall contains a life-size statue of Abraham Lincoln done by the sculptor Jakob Otto Schweizer. On the pedestal beneath Lincoln's feet are four reliefs with the themes of government, life, liberty and nature. The eight bronze panels flanking the niche contain the names of the League members who served the Union. Eight bronze medallions represent Union generals and admirals, who are positioned beneath a carved and gilded Gettysburg Address. The stained glass windows represent each of the branches of the American armed services in 1917, Marines, Navy, Army Corps of Engineers, Infantry, Cavalry and Artillery.